Goals give more direction to our daily life. When we set goals, we focus more on the things we really want, because our brain is easily distracted. We often set too many big goals, so we lose sight of them. Mind mapping helps you to divide your goals into smaller, more easily accessible parts. You can view and monitor all your different goals on just one page. Also, the goals will be small enough to plan them in your agenda. This ensures that you too can become successful in achieving your goals. Let’s start. 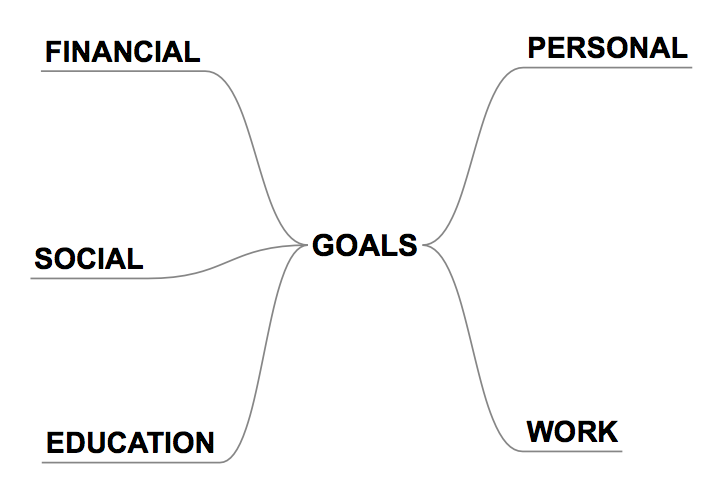 In next section we explain how to create a mind map of your goals in 7 steps. In the first 5 steps we define the goals by collecting, connecting, selecting, organizing and structuring them. In step 6 the mind map becomes more attractive to look at and in the most important step 7 we show how mind mapping helps to achieve your goals. First we start with collecting all goals. 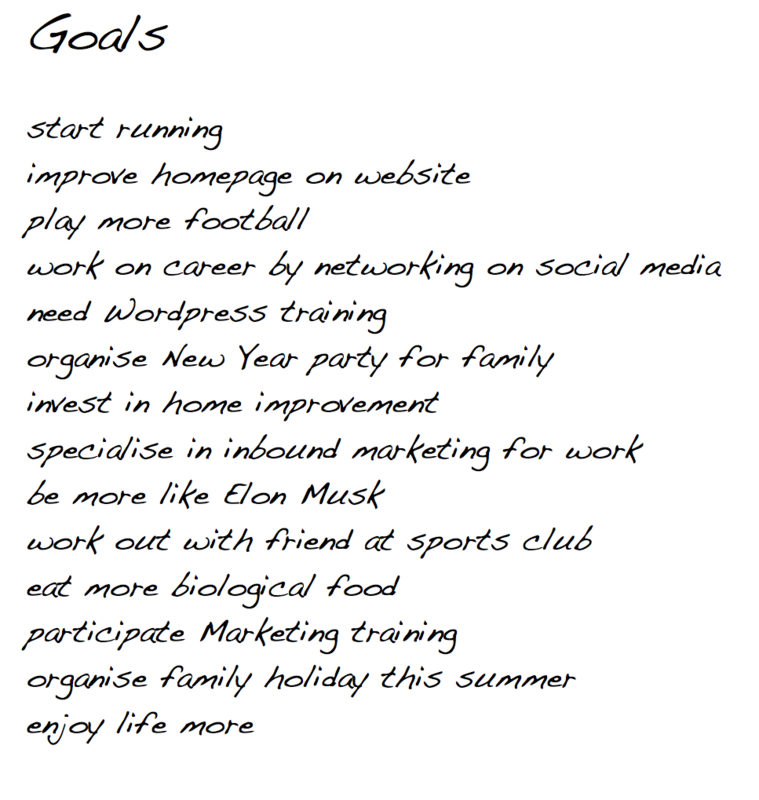 Write down all the goals you want to do in keywords or small sentences. Keep writing till nothing pops up anymore. Collecting many goals is fine, because selection will take place later. The next step is to type the central theme in the centre of a blank page. For the first level around the central theme, we look for general associations. 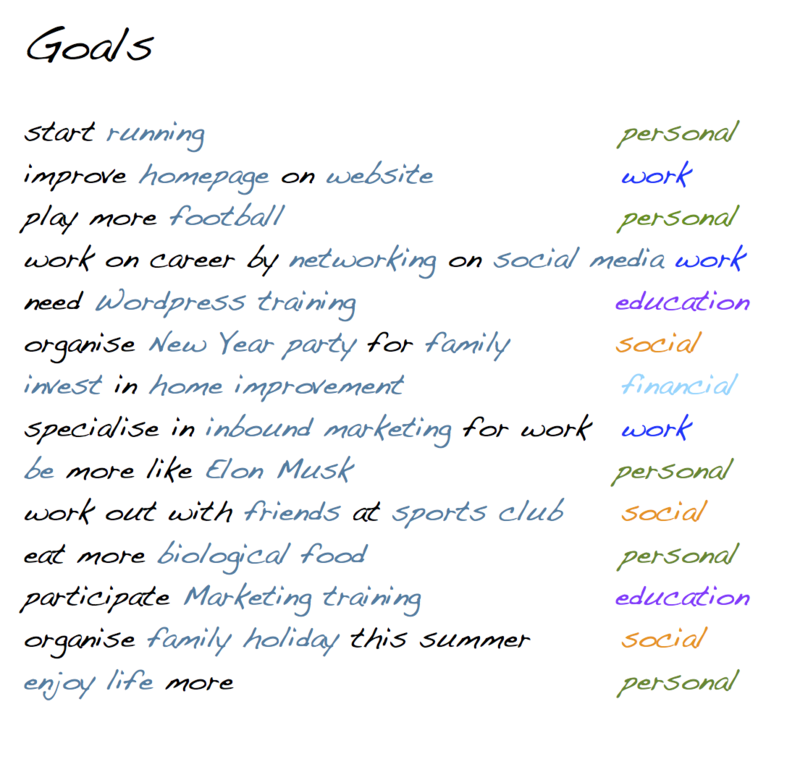 The following categories are a great way to bring order into goals: personal, work, education, social and financial. Now take a look at the goals on the list. To which categories can we connect the goals? 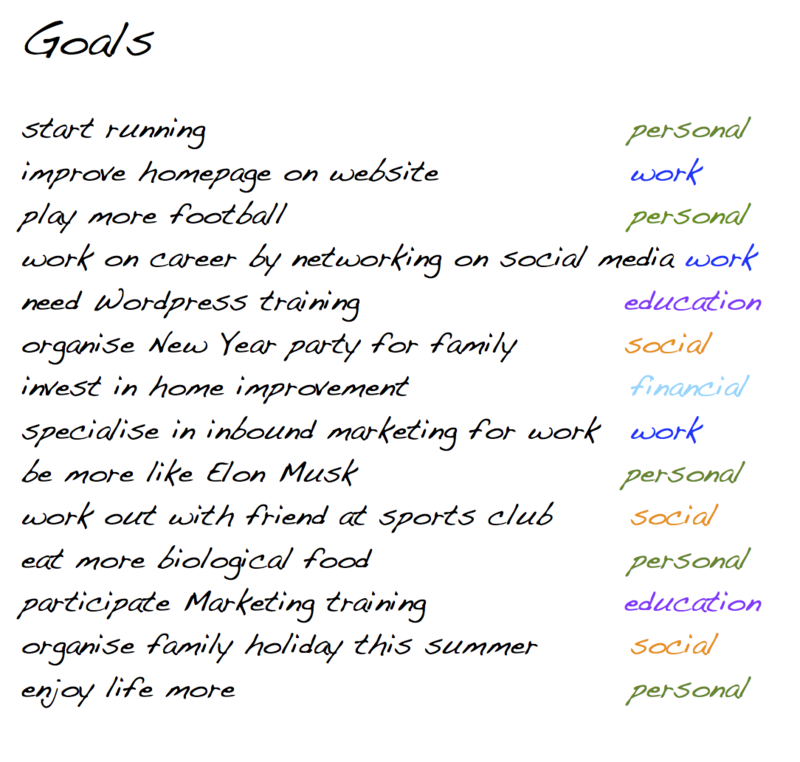 Write behind your goals on the list what kind of goal it is: personal, work, education, social or financial. Connecting the goals to categories is easier, when we use keywords. For each goal we search for one or two specific words that contain the most important information. A w-question can help to do this: What do we want to do? Specific: specific with help of w-questions like: what, where, when..
Measurable:what proofs it, what’s the evidence? Attainable: is it acceptable, possible and can it be planned? Relevant: why do you want to reach this goal and is it the right goal? Time bound: can it be planned in the agenda, is there enough time? Three smart personal goals are selected & connected: running, football and biological food. The other goals are dropped, because these are not smart. We can also select and connect the other goals the same way. 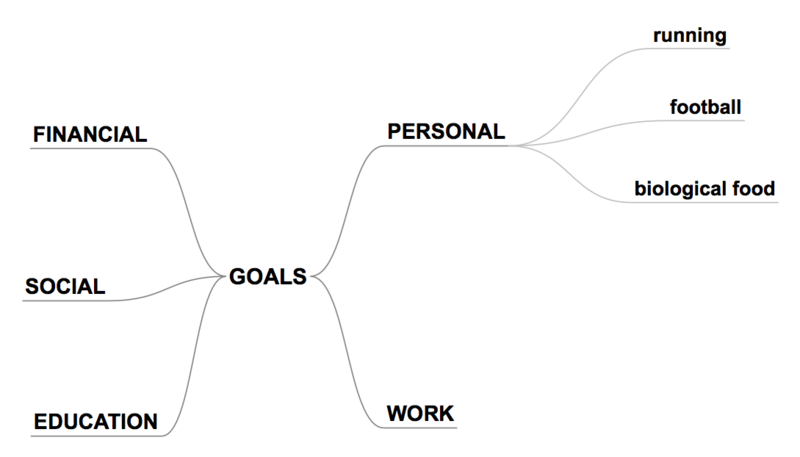 Ordering and structuring goals makes the mind map expandable; adding more associations is possible now or later. Also more goals can still pop up, because ordering & structuring will expand your way of thinking. Ordering and structuring associations from general to specific is important, because this will make adding more associations possible. That’s why we order in personal goals the keyword “food” first and “biological” second. The other goals are arranged in the same way. The result is a mind map that contains all the goals. The next step is to look for a matching image for the mind map. An image can make a mind map more lively and interesting to look at. Color helps to distinguish the different goals, for example “green” for personal “healthy” goals. Adding a couple of icons makes the mindmap more personal. The complete mind map works as a template; it represents all the goals that need attention and time. You can print it and hang it on the wall. This helps to stay focussed and motivated. It is best to work on your goals every day. Making a weekly to do list will make it easier, because your goals become smaller tasks. 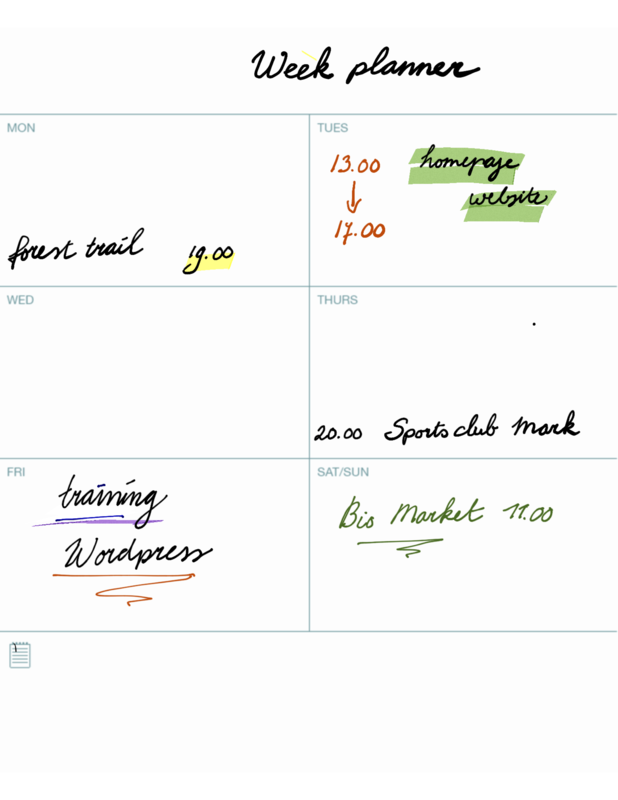 These tasks can be scheduled weekly in the agenda. It is best to evaluate your goals & tasks often. This way, performance or results can be viewed and added to the mind map. Setting goals can really make a difference, because they keep you working on the right things. Mind mapping supports you in selecting the best smart goals by dividing them into small achievable parts. All goals & achievements can be viewed on just one page. Keep working daily on goals by planning in the agenda. Monitoring progress helps to stay motivated, because it’s all about working on smaller goals to achieve the “big” ones.